Windows XP and Vista both have the ability to map other languages to the computer keyboard, giving you the opportunity to form letters with diacritical marks or while using non-Latin alphabets. See this article for Changing Keyboards in Windows XP. Windows Vista can also change keyboards, but you access it differently. This will require you to know the keyboard for the language you want to use. Select the font you want to use in your word processing program. You may have to toggle between the keyboards you have installed with Alt/Shift until the letters you type use the correct symbols. After installing the Hebrew keyboard into the available keyboards on my computer, I selected the font Rod to type in. I found the correct keyboard by toggling through Alt/Shift on my computer, and typing a key each time. After my third toggle, I was using the Hebrew keyboard. Different ע י ן ם Hebrew letters were now typed with each keystroke. As Hebrew is written right to left, the letters I typed also moved across the screen from right to left. I then had to toggle Alt/Shift again to return to the familiar US keyboard. 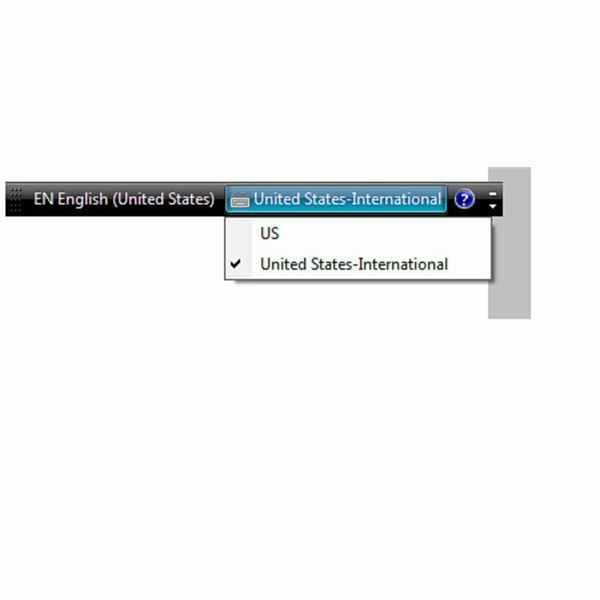 Another method Microsoft provides in Windows Vista to create accent or diacritical marks on individual letters is to install the United States International Keyboard as an option on your computer. You will also see a small icon, which I keep in my task bar. When I hover over it, it tells me whether I have the US keyboard or the United States International keyboard enabled. When the United States International keyboard is enabled, I can use different punctuation marks on the keyboard to form letters with diacritical marks. To form ñ, used in Spanish, I use shift to hit the tilde key. At that point nothing appears. When I then type n, the ñ is formed. To create ç, I type the apostrophe, and then the c key. That is one of the less intuitive letters. My daughter's name, Zoë, is formed by typing the first two letters normally, and using shift to type a double quote, and then typing e, to form ë. When you want to use a punctuation mark normally, you do have to either toggle the icon at the bottom of the screen back to the US keyboard or type the punctuation mark you want to use twice. After a moment you will see both marks. Backspace and the second one will be deleted, and you can now type the letter you want to follow the punctuation mark. Use the double quotation mark “ to create ä, ë, ï, ö, ü, and ÿ. The comma , will create ç. Use the caret or circumflex ^ above the 6 key to create â, ê, î, ô, and û. Use the single quotation ` under the tilde key to create à, è, ì, ò, and ù. The single quotation ` at the bottom of the double quotes key creates á, é, í, ó, ú, and ý. The tilde makes ã and ñ. While there are a number of other diacritical marks, these comprise the most common accent marks used in the Latin alphabet. Language Learning Channel at Bright Hub, so I pinned the Character Map to my Start menu, for easy access. You do this by navigating to the Character Map and right clicking on it. One of the options will be "pin to Start Menu." In the Character map, you can look at each font installed on your system and see which different letters with diacritical marks are included. You may need to scroll down to see all the letters available in the font. Double click on the letter you want, and it will appear in a field under the characters. You can use ctrl/c to select the letter, or if you have clicked on a number of different letters to go to the field, copy all of them. 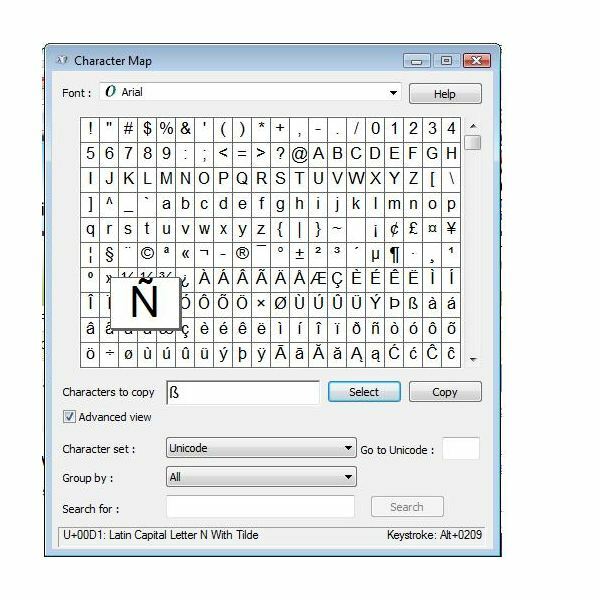 You can also use the alt code shown at the bottom of the Character Map after you selected a letter to create a diacritical mark. I have found it handy to make a document with the alphabet of the unusual letters I do use on a regular basis and save it under the font name. I open that up and copy the individual letter I want and paste it into the document I am working on where it is needed, such as the ß, the German sharp s.
A trick you can use if you have a personal name or other proper noun which includes a letter with a diacritical mark is to fool your spell checker. I type my daughter's name, zoe, in small letters, When I spell check the document or email, the spell checker stops on it. I have added the correct spelling Zoë to the dictionary, and so it offers me Zoë as one of the choices when it gets to that word. In my email, it is the top choice, but in the word processing program it offers me Zoe as the first choice, and I have to scroll to the bottom of the choices to get Zoë. This is less cumbersome than changing keyboards or fishing out the Character Map, but if I were using a lot of words with diacritical marks on a regular basis, I would probably better use the alternative keyboards or the United States International keyboard icon option. There are also Unicode for practically every symbol known to man, but using those is beyond the scope of this article. You can find further information on Unicode and using it in HTML at Wikipedia. Esperanto has some characters with diacritical marks that are not easily typed. You have a couple of options. A download is available where you can get a doc file of the diacritical marks in a number of common fonts. These can be copied into your document so you have the correct character when you need it. Your other option is alt codes. You can read about these in this post on Esperanto diacritical marks.